Today’s post shows you our latest productivity hack: how to use your existing Google Docs or Word 365 documents with our smart proposal software. With our newest import capabilities, you can convert an existing document in Google Docs or Word 365 format into a fully editable PandaDoc template, document or content library item with just one click. Just import, customize, and send it for signing. Quick and easy! We all use web editors for writing, editing, and collaborating on documents (yes, even us Pandas). With the updated import feature, you can extend the power of PandaDoc eSignatures, tracking & analytics to your existing Google Docs and Word 365 documents. This is especially helpful for collaborating with other departments like legal, marketing, and accounting, who might not be using PandaDoc (yet). Now, all you need to do is click “Import,” select your cloud-based document and voilà! You have an editable PandaDoc document. Proceed as usual with any last minute edits or enhancements (insert a video, add a link. this isn’t some boring old PDF!) Add all your fields (for collecting signatures or other information), add your recipients, and hit send! Yes, this works for Templates too! If you use PandaDoc, you know the value of reusable templates. Great news: you can use this same Import feature to turn a Word 365 or Google Doc into a reusable and editable PandaDoc Template. Gone are the days of copy/paste, or worse, starting from scratch. 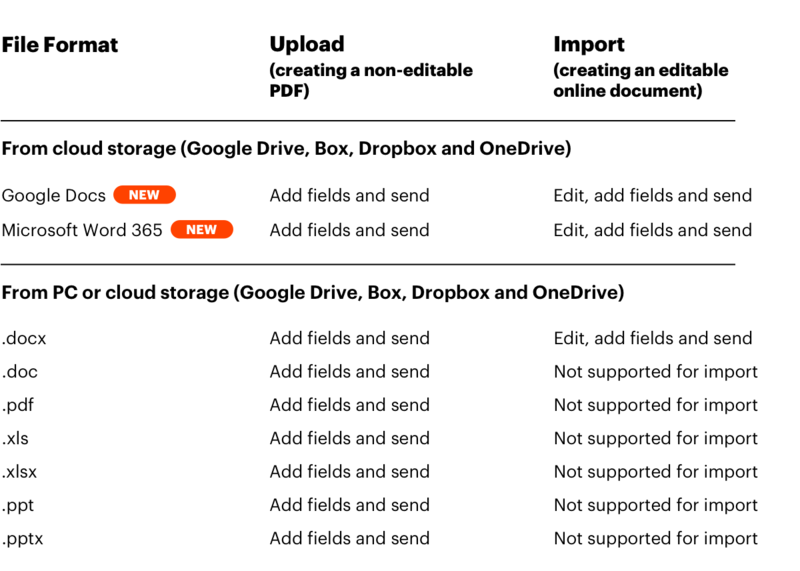 You’ve learned how to import your cloud-based documents and turn them into editable PandaDocs, but sometimes you just want a plain old PDF, uploaded from your cloud storage. Maybe you have a form that needs to be scanned precisely as-is, perhaps it’s an unchangeable legal document, maybe it’s just nostalgia. Whatever your reason, we’ve got you covered. “Import” to create an editable PandaDoc, “Upload” to create a PDF copy. Not sure which to choose? Check out the Cheat Sheet below. Good news! Setup doesn’t require any technical skills or coding. To enable the import feature, head to the Add-on Store, choose the productivity category and enable the “Import-to-Editor” Add-on. The feature is available for all plans at no additional cost. Contact our support team (support(at)pandadoc.com) or submit a ticket within the app if you need help. Once you’ve enabled the Add-on, create a new Template or Document and select the “Import” option. Login to your cloud storage app and start importing! Test drive our updates by logging into your PandaDoc account now or starting a free 14-day trial.